Shipping cards is one of the most contentious hobby-related issues I have seen on social media. PWE, bubble mailer, pony express, armored car with heavily armed guard… everybody has a different opinion of how it should be done. I’ve had a few cards that have been damaged despite great packaging, and some that miraculously arrived in perfect shape in the flimsiest packaging I could imagine. Recently, though, I had a shipping experience that was just plain funny to me. To take a little suspense out of the story, the card was fine. So I bought an Aaron Rodgers rookie card on eBay. Not super high-end, but I spent enough on it to pay for a moderate steak dinner for two. As such, I was pretty interested in getting it here safely. It took a few days to ship, and the seller never put up a tracking number. That happens, but it makes me nervous. When it hadn’t arrived a week after shipping, I started to contemplate the dreaded ordeal of opening a case against the guy on eBay. Ugh. I decided to give it one more day, and sure enough, I had a package pick up slip in my mail the next afternoon. Joy! Neatly addressed, shipped certified mail, a plain blue greeting card envelope. That’s an expensive way to ship PWE (or PBE, as it were). Still, seemed in good shape, so I smiled it off and was thankful it arrived safely. My smile turned into a chuckle as I opened the envelope. A trusty canine courier to get my card to me. In a top hat, because why not? L.O.L. Sure enough, stuck to the inside with double sided tape, was good old A-A-Ron himself. GO PACK GO! I’ve found that at some point in the last year my collecting hobby has grotesquely morphed into just buying cards. I have constantly browsed eBay, Twitter and all the usual haunts for cards or break spots to buy. 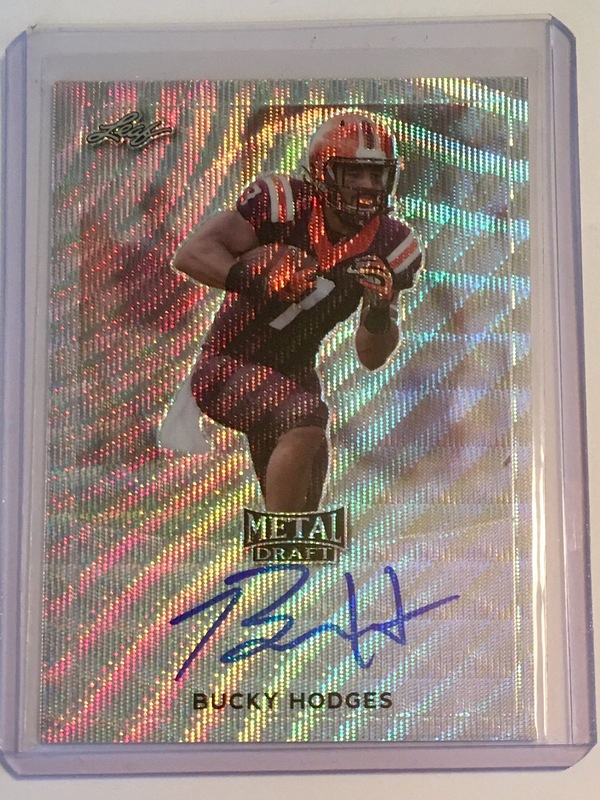 I get excited about a good pull in a break or getting a deal on a card I want. Then the cards show up in my mailbox, I look at them for a few fleeting seconds, and they go in a box. These boxes fill and form stacks. These stacks are now one of the more notable features of a small room in my house. Stacks of the conquests of my buying hobby. Stacks of anonymous cardboard treasures, many of which I barely remember that I have. I have all sorts of grand plans to sort them, organize a few sets, display my favorite cards and maybe let go of some cards somebody else would like more than I do. Those plans may as well be in stacks of boxes collecting dust, too. I don’t have a big finish, grande finale, or even a corny joke to end this post with. (Although I did end that last sentence with a preposition. Shame!) I really just wanted to throw this stream of consciousness out into the ether to get it off my chest. Thanks, and rest assured there will be new and far more lighthearted blog posts here in the future! Blogging has been slow for me lately, but everything else has been moving at warp speed! I won’t say I’ve boldly gone where no man has gone before, I’ve just been neglecting my entries in the Captain’s log. Having found a few moments to meditate on the Force, however, Obi-Wan implored me to go to the WordPress app and continue my blogging. Realizing the mixed references have probably inspired the First Order to ally with the Klingons by now, I will turn to Capt. 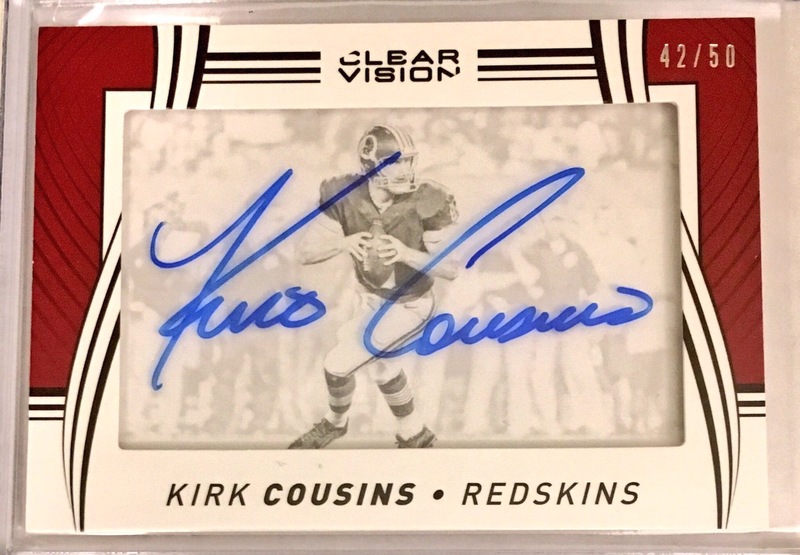 James T. Kirk (Cousins) to bail me out with this crisp, gorgeous autograph! These cards look amazing with so much open space for the signature. This is one of the only autograph sets I’ve seen that truly focuses on, you know, the autograph, and the results are… out of this world. Panini Black Gold is one of my favorite current products, and I knew when I saw these cards in the initial teases for this year’s edition that I would have to grab any Packers cards like this. 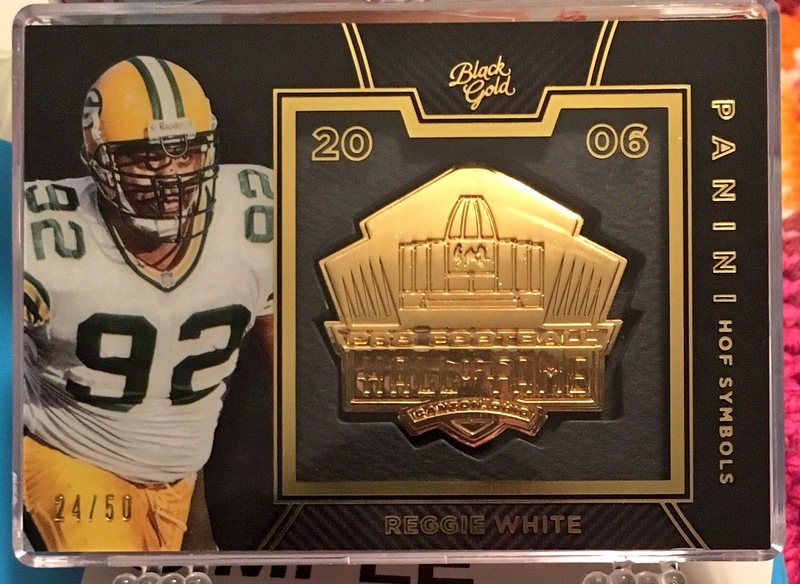 Sure enough, Bart Starr, Brett Favre, and Reggie White are all part of the HOF Symbols set. White is the only one I’ve tracked down so far, and it’s a beaut! That gold colored HOF Symbol medallion really shines against the black background of this card. Great display piece, for sure, and it will look awesome next to Starr and Favre when I pick them up! 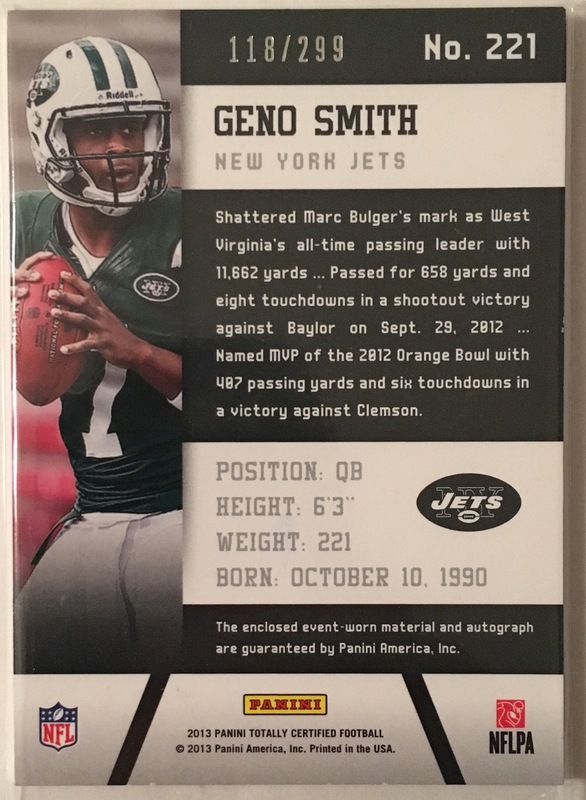 I mentioned in part 2 of my blog post about opening a 2013 Totally Certified Football case that I pulled a disappointing number of redemption cards. 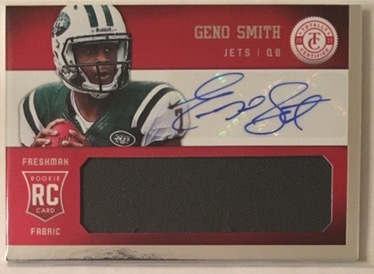 Lucky for me, Panini still honors them – even the “expired” ones! In fact, I’ve already received the first card from them. (Bravo, Panini!) 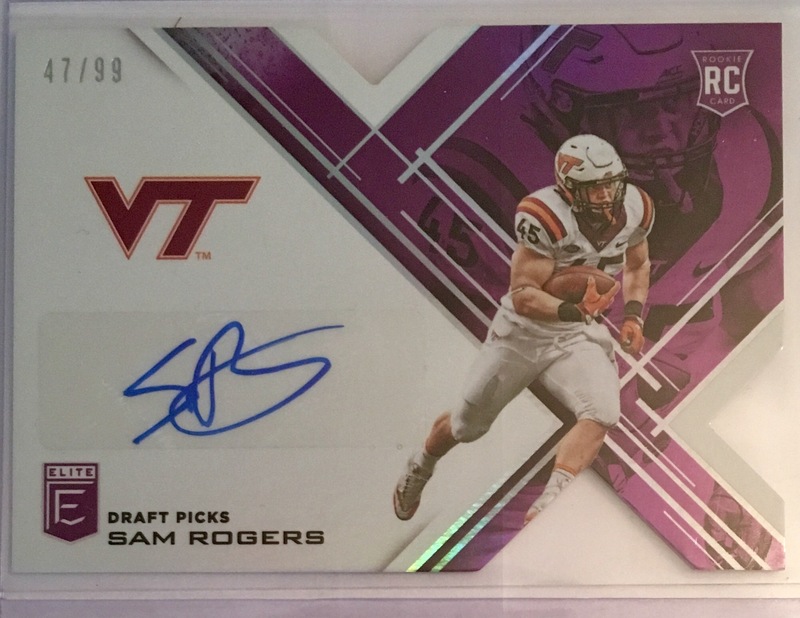 This was one of the big names from that draft, and I’m pretty happy to get this card, even if the star power here has faded since 2013. Still, a nice card and a very presentable autograph.